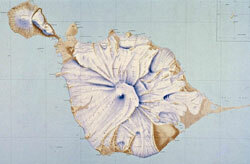 Indian Ocean part of a map showing the main topographic features of the ocean floor produced by a US Government agency; Heard Island lies on the large submarine Kerguelen Plateau in the lower centre part of the image (north of the Antarctic mainland); the plateau was formed by large-scale eruption of basaltic lavas, mainly below sea-level. Rogers Head (rear) and Balanced Rock (front) at the northern end of Azorella Peninsula; both are remnants of a large volcanic cone which has largely been eroded away by the sea. 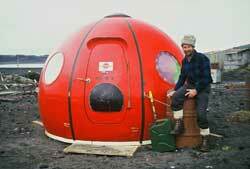 Geologist Dr Graeme Wheller beside his Apple accommodation at Atlas Cove station. By PATSY HOLLIS | Heard Island is windswept, mountainous and eerily beautiful, home to many creatures that thrive in the peace and safety of this island outpost of Australia. 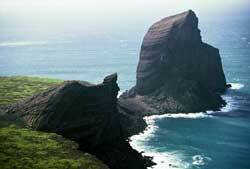 It is also home to Australia's only volcano. 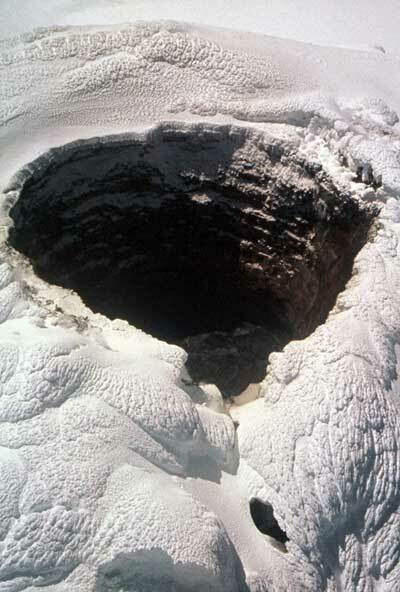 Summit crater of Mawson Peak (highest part of Heard Island) showing notch through which magma flowed to form the 1985 lava flow. View from helicopter overflight. Kingston-based Graeme Wheller, formerly a volcanologist, today involved in Tasmanian tourism, took the photographs you see here when in 1986-7 he was part of a scientific expedition to Heard Island. A team of 20 people spent 60 days on this wild and remote place in the southern ocean. 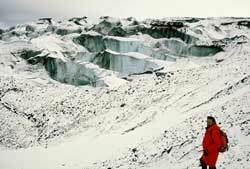 Graeme was one of the two geologists on the team that included among others, botanists, zoologists, glaciologists and helicopter crews. His mission was to study the active volcano, Mt Mawson. Base camp was at Atlas Cove, where the old Australian base hut had been built in 1947, but long ago abandoned. 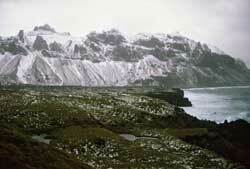 Though time and severe weather have left little of it, it’s still the focal point of activities for any expedition. Graeme lived there in one of the three-person bright red “apples” you see here, but also spent a great deal of his time camping out in a tent. He says it wasn’t too cold, because in December and January the weather can be a “balmy” 10-12°C, although plummeting to 0-1-2°C when the cold winds blow — and on this speck of land in a tumultuous ocean they very often do. Which meant the helicopters, sent there to act as taxis around the island, were only able to fly Graeme over the summit of Mt Mawson on just four days. On one occasion the helicopter did land and put Graeme down so he could collect rocks from the top, but realising that the rocks were well and truly glazed within a deep ice layer and moreover it was a most precarious place to be, after 10 minutes he was back in the ‘copter. However, it showed that the original plan to climb to the top (there were also two Army mountaineers on the expedition) would have been a waste of time and energy; and it did allow some fascinating glimpses into the maw of an active volcano. A fascinating place altogether, says Graeme of Heard Island, and better than a trip to the Antarctic mainland because the terrain is varied and very mountainous and there’s a strip of green vegetation around the shoreline. It’s also a gathering place for many more animals, birds and sea creatures. Unfortunately for us, it’s also next to impossible to get to. So for the moment we’ll have to enjoy it vicariously through photographs like these. 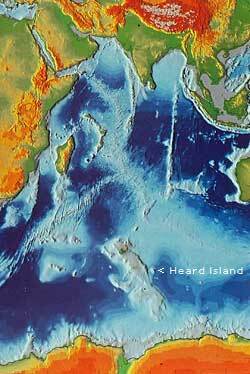 For a full account of Graeme’s geological analysis of Heard Island, go here. § And a note of Graeme Wheller himself: being a geologist led him to an adventurous life, studying volcanoes in Bali while writing his PhD thesis at the University of Tasmania, mineral exploration off the coast of Papua New Guinea (of which he says “500 million years ago, this is how the West Coast of Tasmania would have been”) and as a consultant in Fiji. In the end, the Hobart area became the permanent location for Graeme and his family and today he has a new enthusiasm — specialist tours in a luxury bus around our own island. More details here. Like weathered graves neatly lined up on the barren shore, these remnant wooden oil barrels at Oil Barrel Point cast their own spell at Heard Island. 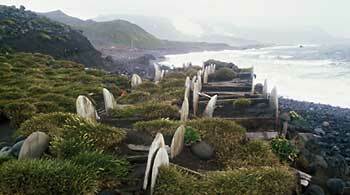 They were left behind after the 19th century sealing expeditions.